What do you get when you turn the classic children's book Horton Hears a Who! by Dr. Seuss into a box office hit? A family movie that you will want to see again and again! The third Dr. Seuss movie to hit the silver screen in less than 10 years is a charming tale about friendship, trust and the understanding that "a person's a person, no matter how small." Originally written in 1957, Horton Hears a Who! by Dr. Seuss is about an elephant named Horton who finds "speck of dust" floating in the air. The speck, which lands on a clover, is actually the town of Who-ville that has lost its way in the world. 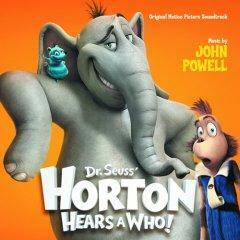 Horton hears the cries for help by the town mayor, but no one else can. Other animals that live in the Jungle of Nool, specifically a kangaroo, a trio of monkeys called the Wickersham brothers and an old eagle named Vlad Vladikoff, think Horton's claim is nonsense and tries to destroy the speck and clover. In the end, Horton and his will and good nature prevail, and the town of Who-ville is saved. This book was made into an animated television movie in 1970, which brought to life the lively characters of Horton, his forest friends and the entire town of Who-ville. Horton Hears a Who!is the third Dr. Seuss tale to be made into a major motion picture. The Grinch Who Stole Christmas, starring Jim Carrey, came out in 2000, and The Cat in the Hat with Mike Myers, was released in 2003. While the storyline between the movie and book are parallel, some differences do prevail, which only make the tale more interesting. The film version brings Horton and the other characters into the 21st century with inclusion of who-phones (cell phones), computers, pouch-schooling (homeschooling) and WhoSpace (MySpace). The film version of Horton Hears a Who! also adds another storyline: The relationship between the Mayor and his only son, JoJo, the latter of whom ultimately saves Who-ville from destruction when his "wee" voice stands out above all the others and allows the animals in the Jungle of Nool to realize that there is a town on the speck of dust. I took my almost 3-year-old son and 6-year-old daughter to a morning matinee (less crowded at 9:30 a.m.) and we loved it. The movie kept my daughter's attention the entire 88-minute running time with its colorful songs, exquisite animation and captivating storyline. With its G rating, I knew I wouldn't have to worry about adult overtones emasculating from the script. The movie was funny. Jim Carrey was funny, and Steve Carell was hilarious. Carol Burnett gave Sour Kangaroo such a salty personality, you could never tell she wasn't one of the main characters. My favorite parts? The ending when all of Who-ville, including JoJo, could be heard shouting "We are here! We are here! We are here!" I love children's movies that have happy (rather than sappy) endings. And I loved the music. Who could resist singing along with JoJo and the rest of Who-ville and the Jungle of Nool to REO Speedwagon's 1980s hit, Can't Fight This Feeling? Would I see it again? If my son was older, yes, because once the popcorn ran out, he was ready to go. Not exactly the perfect movie for an energetic toddler, but definitely one for the whole family.